In Dictionary of Logical Fallacies Panderbear noted that panderers often use one or more logical fallacies to obfuscate an issue and support false conclusions. These fallacies reduce their arguments to empty pandering even when spiced up with cherry-picked facts. 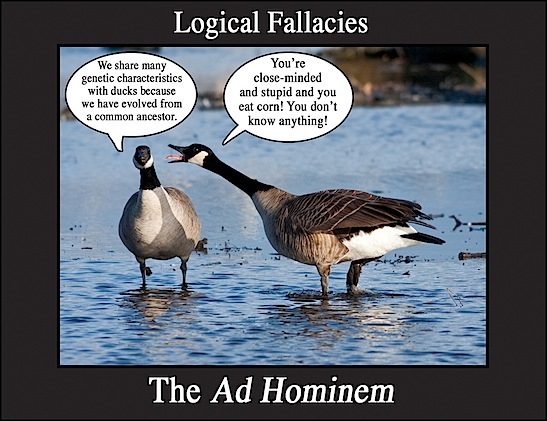 Arming yourself with knowledge of common logical fallacies will afford you some measure of protection against pandering. What follows is the second installment of a dictionary of logical fallacies. Study these fallacies well. There will be a quiz. False Dilemma - Present an either or argument when other options exist. Guilt by Association - Argument is false because people I don't like agree with it. Hasty Generalization - Draw conclusion about population based on too small a sample. Middle Ground - Assume the centrist position is correct. Misleading Vividness - Give dramatic example more weight than statistical evidence. Poisoning the Well - Unfavorable information about person used to discredit future claims. Post Hoc Ergo Propter Hoc - One thing preceding another is not proof of a causal relationship. Red Herring - Introduce irrelevant topic to divert attention from original issue. Slippery Slope - Assert event inevitably follows from another without proof. Straw Man - Attack misrepresented version of opponents position. Two Wrongs Make a Right - Justify an act against another by asserting they would do the same.